Last week the lady folk in my family engaged in a husband-less, child-filled night of talking and teasing (and some really corny jokes Steph found on her phone). In between fetching runaway babies and cooling a few hot spots with the toddler crowd we actually had a pretty decent conversation. Perhaps the point we all agreed upon this semi-annual meeting was the thought that the days of huge families (eight, nine, ten, The Duggars) are over. I mean, sure there will always be women who want to brave the fertile trenches of their time (and please know I salute those women, I consider being born one of nine one of the best things that ever happened to me). But it seems with a life more complicated, and choices more extreme, and lifestyles more intense it lends itself to smaller family sizes. In short, I don't think parenting is as simple as it used to be. And let's be honest. I grew up in the heart of Mormondom, five kids is average to me. Six is getting big. But it's not huge until there are two sets of four. That's two whole big families in one (check my math). While I was the one who actually stated, "The era of big families might be over," I didn't realize how soon I'd find out why. Today I took my sister's children for awhile. That meant for a few hours I had six kids. Do you know the noise and energy level six kids attracts? Other children. More children. Children from around the neighborhood hopping over the back fence. Suddenly six kids turns into nine. Lightening quick too. You know what I am talking about, don't you? Then, nine children get snacky all at once. So suddenly I wasn't feeding my original two, no, I am finding Popsicles in the deep recesses of my freezer (bent over, arms swallowed up in the halibut from last summer and seven bags of edamame) for nine children. I was lucky I could even find nine, much less meet the color-preferences of all the Easily Disappointed. Then they wanted to play Ninjas and I got the (coveted) role of MASTER. Master's job is to make up imaginary tasks to keep the Ninja force busy, loyal and benevolent. ("Master! I have completed the task you ask me to do, what next?" times nine, times nine again). Now, I am not complaining. I love it more than anything. I find that before I had embarked upon parenthood, I had grossly miscalculated the actual body count. There is no consideration for the extra humans that become attached to your own children. I have my son, I have the twins next door, I have their best friend from two houses down. I have a party in my Green Room. I always wanted a huge family of my own, but truthfully I don't think I am headed towards that adventure. And maybe this is why the era of big families are over. It's not that I don't see the beauty of an increase in posterity, I am just beginning to realize how much that increase increases and multiplied by the demands of the day I am also starting to see my limits. BUT I see now how I can help raise, love and care for many kids. In fact, it became apparent to me today it might be good to have some spare space in my life for the children who come to my house daily. Also, extra string cheese, green apples and new ninja assignments (for starters). Maybe I won't birth eight kids, but that doesn't mean there won't be room if eight show up around dinner time. All I am saying is this: if it takes a village, I'm leaving some room in my hut. 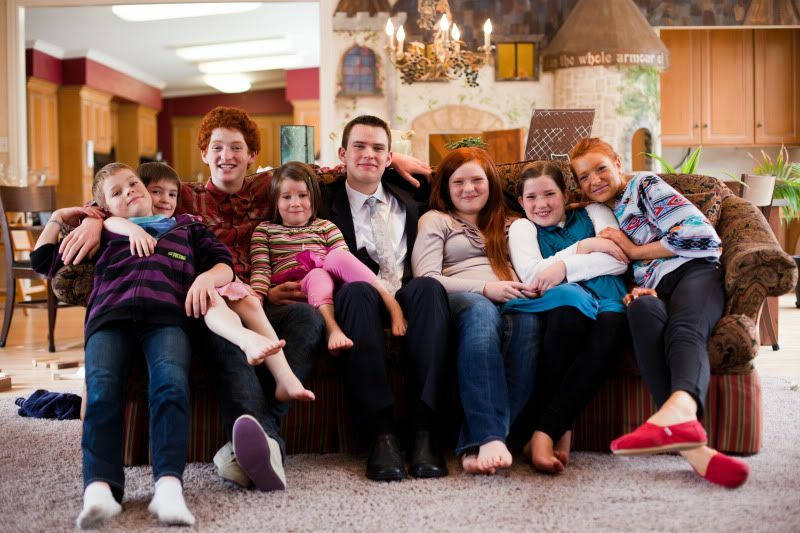 *photos taken of Page's eight children, the day her oldest Layton went into the MTC last month. So fun!